One of the many surprises of parenthood happens in the moments I desire to recreate memories from my own childhood. Simple activities that were long forgotten bubble to the surface as I look into the eyes of my own children. Holding my children's hands and walking through the grass in bare feet, picking a dandelion and blowing hard to scatter its seeds to and fro, sucking on a lemon while sitting on hot concrete... all simple moments that happened decades ago and have been replanted into the newly created psyche of my kid's childhood memories. Some memories are easily repeatable. Others, not so easy. Last week, a simple conversation led me into a wild goose chase of one of my childhood memories. Let's start with two words: Magic Shell. If you're of a certain generation you'll immediately ooh and ahh at the mention of this wondrous ice cream topping that magically turns solid when poured atop a milky scoop of your favorite flavor. My sister and I downed many a bottle attempting to build the perfect rock hard coating when we were a bit younger. So, while whipping up a batch of spaghetti in my kid's pastel colored play kitchen, my daughter announced that I should concoct a perfect pairing of dessert for her plastic noodles is was only natural that I immediately said "Okay, how a bout vanilla ice cream with magic shell?" The land of the imaginary meal cooking halted abruptly and everyone wanted to know what Magic Shell was. I recognized the sparkle in their eyes and knew a fire had been lit. The kids and I popped on our sun hats and headed out on a walk to the store. Let's just cut to the chase on this one... no magic shell at the local Bangkok Market. Surprise. Carting two cranky kids home who babbled on and on about how life would not be the same without magic shell was not fun. So, the next morning, I spent two hours chasing down Bangkok's lone bottle of pseudo Magic Shell (actually produced by some other company and delivered under an impostor name of... Hard Coat). The impostor would have to do and I whipped it out after dinner to drizzle on to little scoops of vanilla ice cream. As I watched my kids thwack away at the waxy cocoa coating, I smiled knowing that another childhood memory was taking root. For anyone who was, is or wants to be a fan of that magical ice cream topping... cheers to you! Place a cocktail glass into the freezer. Allow to chill for at least 10 minutes, remove and swirl with magic shell. Place back into the freezer. In a saucepan, warm cream over low heat with the cocoa powder and sugar. Stir until dissolved and allow to cool. 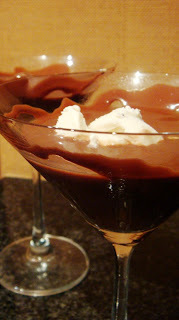 * Once the glass is chilled and the chocolate cream mixture is cooled, add several cubes of ice to a cocktail shaker. Into the cocktail shaker add the coffee liqueur, vodka, espresso, and chocolate cream mixture. Shake. Strain drink into prepared glass and top with a float of ice cream. Enjoy being a grown up kid! *Since one ounce of cream is such a small amount, you may want to make extra and keep it in the freezer for future beverage making! Brilliant! Really, and I don't even like vodka! I too am of the generation who loved Magic Shell. In fact, my grandmother was one of those ladies in the supermarket who did demos of items and she demo'd magic shell so we had an endless supply as kids. How long does the coating stay hard on the glass? Thanks, formerchef! And, truth be told, I'm not a vodka fan either (unless it's disguised in a great drink!). As long as the glass is chilled, the coating stays hard until you're well into your drink... which by then, it's nice to have it melt in (so you don't have to hack it off the glass!). Oh, and I should mention, all bets are off if one should choose to drink this in Bangkok's outdoor climate. I give it about 10 seconds before the whole thing melts in that case.